I was also recommended to join the Escoffier Competition Team for our school, which was a HUGE honor! I was a bit nervous starting out, since the others are all either week 20 or week 12 (of a 30 week program), but we practiced the skills set for the state competition this week and I think I held my own. =) The state competition involves a skills salon- filleting a fish, fabricating a whole chicken, knife skills, and pastry skills- as well as a 4-course menu that we develop ourselves. The state competition is in November, but only 5 of us get to actually compete so wish me luck! This week I was also the “team chef” for my class. Each week a new student gets to be the team chef, which is like being a sous chef. We had to write production lists and make sure our team got everything done on time and correctly. It was a lot of fun. We made stocks, mayo, sauces, grains, rice, legumes, chicken, potatoes and much more this week. 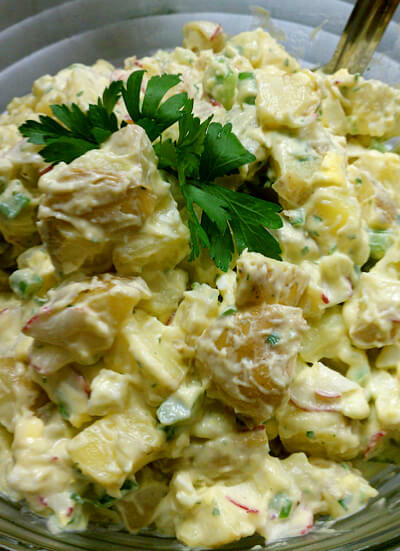 We made out own mayo and aioli, then used them to make potato salad, below is my team’s end product. I am definitely looking forward to what is coming next, since the beginning has kind of been stuff I already know. 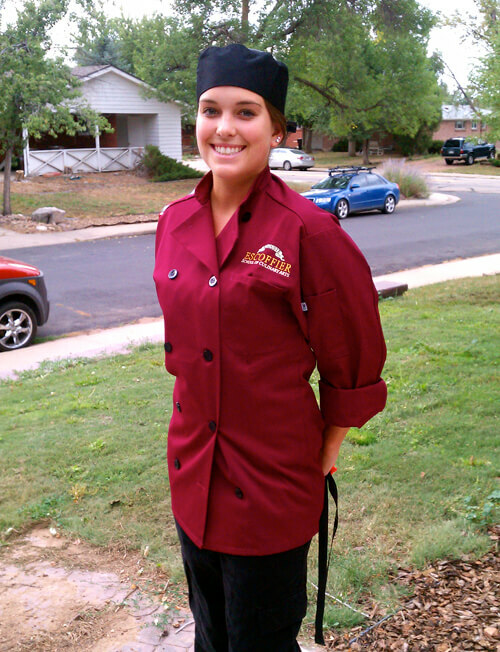 I will keep you all posted on my exciting experience in culinary school! If you have any culinary questions please ask and I can help you out! This is was first-hand view of a place I’ve always wondered about… culinary school. I don’t have any aspirations to put myself in those grueling confines (yet…), but it’s wonderful to hear what it’s really like from someone “who knows.” Congratulations on being appointed to the Competition Team (they know a contender when they see one!) and also for becoming a Team Leader. I’m sure your classmates are thriving under your experience and encouragment. Woohoo! Arrgghh… sorry I mis-typed “encouragement.” (This, from a writer, ha!) But, it also gave me the opportunity to say, “You look terrific in your uniform!” Question: what DO you call your training duds? And how long before/when do you earn your Chef’s toque? I love the color of your jacket! 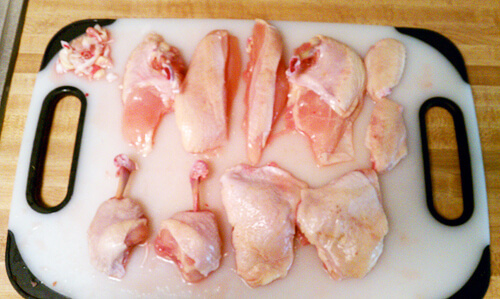 And look at that chicken cut to pieces by Chef Jenny! 🙂 Culinary School…that is awesome! Thrilled to be keeping up with your schooling. Part 1 was captivating. Looking for more.